WB: ARRB2 transfected HEK-29sT cells. IHC-P: Human tonsil tissue. ICC/IF: HeLa cells. IP: HEK-293T cells. Our Abpromise guarantee covers the use of ab54790 in the following tested applications. Functions in regulating agonist-mediated G-protein coupled receptor (GPCR) signaling by mediating both receptor desensitization and resensitization processes. During homologous desensitization, beta-arrestins bind to the GPRK-phosphorylated receptor and sterically preclude its coupling to the cognate G-protein; the binding appears to require additional receptor determinants exposed only in the active receptor conformation. The beta-arrestins target many receptors for internalization by acting as endocytic adapters (CLASPs, clathrin-associated sorting proteins) and recruiting the GPRCs to the adapter protein 2 complex 2 (AP-2) in clathrin-coated pits (CCPs). However, the extent of beta-arrestin involvement appears to vary significantly depending on the receptor, agonist and cell type. Internalized arrestin-receptor complexes traffic to intracellular endosomes, where they remain uncoupled from G-proteins. Two different modes of arrestin-mediated internalization occur. Class A receptors, like ADRB2, OPRM1, ENDRA, D1AR and ADRA1B dissociate from beta-arrestin at or near the plasma membrane and undergo rapid recycling. Class B receptors, like AVPR2, AGTR1, NTSR1, TRHR and TACR1 internalize as a complex with arrestin and traffic with it to endosomal vesicles, presumably as desensitized receptors, for extended periods of time. Receptor resensitization then requires that receptor-bound arrestin is removed so that the receptor can be dephosphorylated and returned to the plasma membrane. Mediates endocytosis of CCR7 following ligation of CCL19 but not CCL21. Involved in internalization of P2RY1, P2RY4, P2RY6 and P2RY11 and ATP-stimulated internalization of P2RY2. Involved in phopshorylation-dependent internalization of OPRD1 and subsequent recycling or degradation. Involved in ubiquitination of IGF1R. Beta-arrestins function as multivalent adapter proteins that can switch the GPCR from a G-protein signaling mode that transmits short-lived signals from the plasma membrane via small molecule second messengers and ion channels to a beta-arrestin signaling mode that transmits a distinct set of signals that are initiated as the receptor internalizes and transits the intracellular compartment. Acts as signaling scaffold for MAPK pathways such as MAPK1/3 (ERK1/2) and MAPK10 (JNK3). ERK1/2 and JNK3 activated by the beta-arrestin scaffold are largely excluded from the nucleus and confined to cytoplasmic locations such as endocytic vesicles, also called beta-arrestin signalosomes. Acts as signaling scaffold for the AKT1 pathway. GPCRs for which the beta-arrestin-mediated signaling relies on both ARRB1 and ARRB2 (codependent regulation) include ADRB2, F2RL1 and PTH1R. For some GPCRs the beta-arrestin-mediated signaling relies on either ARRB1 or ARRB2 and is inhibited by the other respective beta-arrestin form (reciprocal regulation). Increases ERK1/2 signaling in AGTR1- and AVPR2-mediated activation (reciprocal regulation). Involved in CCR7-mediated ERK1/2 signaling involving ligand CCL19. Is involved in type-1A angiotensin II receptor/AGTR1-mediated ERK activity. Is involved in type-1A angiotensin II receptor/AGTR1-mediated MAPK10 activity. Is involved in dopamine-stimulated AKT1 activity in the striatum by disrupting the association of AKT1 with its negative regulator PP2A. Involved in AGTR1-mediated chemotaxis. Appears to function as signaling scaffold involved in regulation of MIP-1-beta-stimulated CCR5-dependent chemotaxis. Involved in attenuation of NF-kappa-B-dependent transcription in response to GPCR or cytokine stimulation by interacting with and stabilizing CHUK. Suppresses UV-induced NF-kappa-B-dependent activation by interacting with CHUK. 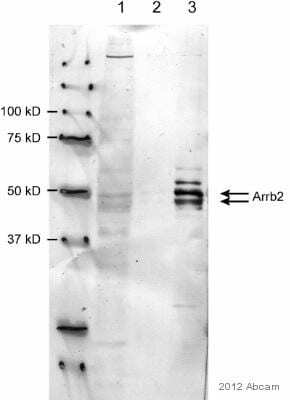 The function is promoted by stimulation of ADRB2 and dephosphorylation of ARRB2. Involved in p53/TP53-mediated apoptosis by regulating MDM2 and reducing the MDM2-mediated degradation of p53/TP53. May serve as nuclear messenger for GPCRs. Upon stimulation of OR1D2, may be involved in regulation of gene expression during the early processes of fertilization. Also involved in regulation of receptors others than GPCRs. Involved in endocytosis of TGFBR2 and TGFBR3 and down-regulates TGF-beta signaling such as NF-kappa-B activation. Involved in endocytosis of low-density lipoprotein receptor/LDLR. Involved in endocytosis of smoothened homolog/Smo, which also requires ADRBK1. Involved in endocytosis of SLC9A5. Involved in endocytosis of ENG and subsequent TGF-beta-mediated ERK activation and migration of epithelial cells. Involved in Toll-like receptor and IL-1 receptor signaling through the interaction with TRAF6 which prevents TRAF6 autoubiquitination and oligomerization required for activation of NF-kappa-B and JUN. Involved in insulin resistence by acting as insulin-induced signaling scaffold for SRC, AKT1 and INSR. Involved in regulation of inhibitory signaling of natural killer cells by recruiting PTPN6 and PTPN11 to KIR2DL1. The [DE]-X(1,2)-F-X-X-[FL]-X-X-X-R motif mediates interaction the AP-2 complex subunit AP2B1. Phosphorylated at Thr-382 in the cytoplasm; probably dephosphorylated at the plasma membrane. The phosphorylation does not regulate internalization and recycling of ADRB2, interaction with clathrin or AP2B1. The ubiquitination status appears to regulate the formation and trafficking of beta-arrestin-GPCR complexes and signaling. Ubiquitination appears to occurr GPCR-specifc. Ubiquitinated by MDM2; the ubiquitination is required for rapid internalization of ADRB2. Deubiquitinated by USP33; the deubiquitination leads to a dissociation of the beta-arrestin-GPCR complex. Stimulation of a class A GPCR, such as ADRB2, induces transient ubiquitination and subsequently promotes association with USP33. Stimulation of a class B GPCR promotes a sustained ubiquitination. Cytoplasm. Nucleus. Cell membrane. Membrane > clathrin-coated pit. Cytoplasmic vesicle. Translocates to the plasma membrane and colocalizes with antagonist-stimulated GPCRs. Beta Arrestin 2 antibody (ab54790) used in immunohistochemistry at 3ug/ml on formalin fixed and paraffin embedded human tonsil. 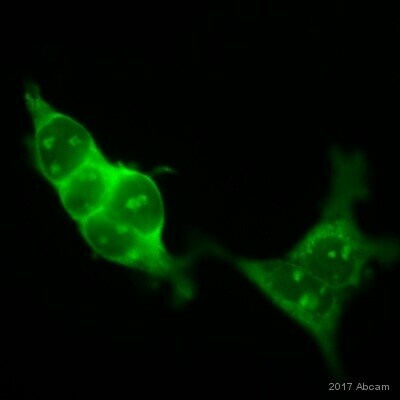 ab54790 at 10 ug/ml staining Beta Arrestin 2 in human Hela cells by Immunocytochemistry / Immunofluorescence. Overlay histogram showing HeLa cells stained with ab54790 (red line). The cells were fixed with 4% paraformaldehyde (10 min) and then permeabilized with 0.1% PBS-Tween for 20 min. The cells were then incubated in 1x PBS / 10% normal goat serum / 0.3M glycine to block non-specific protein-protein interactions followed by the antibody (ab54790, 1μg/1x106 cells) for 30 min at 22°C. The secondary antibody used was DyLight® 488 goat anti-mouse IgG (H+L) (ab96879) at 1/500 dilution for 30 min at 22°C. Isotype control antibody (black line) was a mix of mouse IgG2a [ICIGG2A], (ab91361, 1μg/1x106 cells) used under the same conditions. Acquisition of >5,000 events was performed. This antibody gave a positive signal in HeLa cells fixed with 80% methanol/permeabilized in 0.1% PBS-Tween used under the same conditions. Beta Arrestin 2 immunoprecipitation from Human HEK293T cells using ab54790. 1000 µg of cell lysate was incubated with primary antibody (3 µg/mg cell lysate) and matrix (resin) and incubated for 1 hour 30 minutes at 4°C. Publishing research using ab54790? Please let us know so that we can cite the reference in this datasheet. I would like to test the antibody ab54790 in immunoprecipitation of the endogenous protein from human cells, which is not a tested application for this antibody. Unless you have knowledge that this antibody is not suitable for this application, I would like to request a testing discount for this antibody. I am very pleased to hear you would like to accept our offer and test ab54790 in IP. This code will give you 1 free primary antibodybefore the expiration date. To redeem this offer, please submit an Abreview forIP and include this code in the “Additional Comments” section so we know the Abreview is for this promotion. For more information on how to submit an Abreview, please visit the site: www.abcam.com/Abreviews.